Stan Wawrinka’s tennis racquet is marketed as a Yonex VCORE Pro 97 330, but is actually an older Yonex VCORE 95D racquet. A lot of recreational players wonder about Stan Wawrinka’s tennis racquet. What racquet does he use to get that pace and spin on his shots? Stan Wawrinka is advertised to use the latest Yonex VCORE racquet, currently the Yonex VCORE Pro 97 330 , but actually uses the Yonex VCORE 95D with a lot of lead tape . So now the racquet companies are forced to write “endorse” instead of use. This is the case with a lot of pro player racquets. Many professional tennis players use pro stock racquets, which can be racquets with custom molds, based on older versions. Stan Wawrinka’s racquet is smaller and with the lead tape it’s also heavier than the Yonex VCORE Pro 330 . Should you play with Stan Wawrinka’s tennis racquet? I doubt that you will play better tennis with Stan Wawrinka’s tennis racquet. 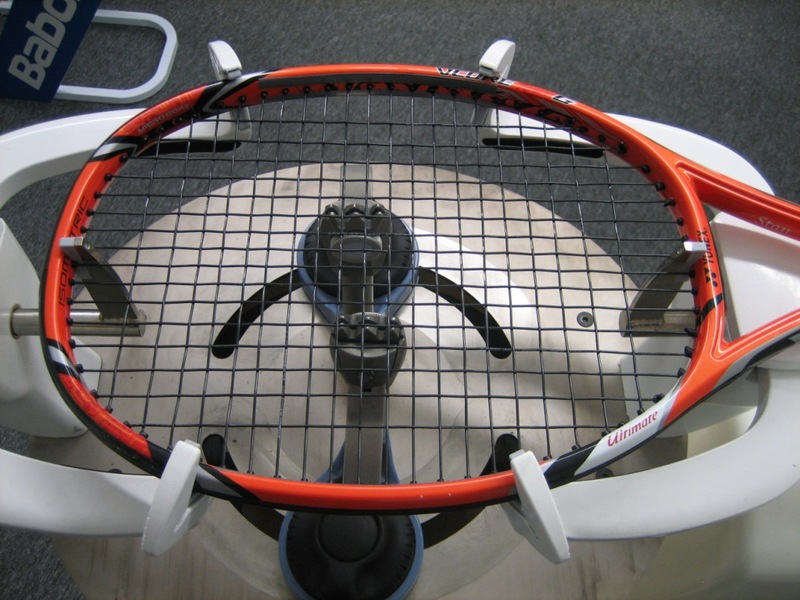 Most pro player racquets are heavier and more difficult to handle than recreational tennis racquets. If you look at the specs Wawrinka play with it is definitely only for advanced players. But the Yonex VCORE 95D racquet without customization is a great racquet and I wrote about it in my racquet honeymoon period post here. The Yonex VCORE Pro 97 330 racquet along with its cousin, the 310 gram version are also very good racquets for the advanced player. I would definitely recommend the lighter spec for a wider group of styles and abilities. And you can also always add some weight to it by a leather grip and/or lead tape . 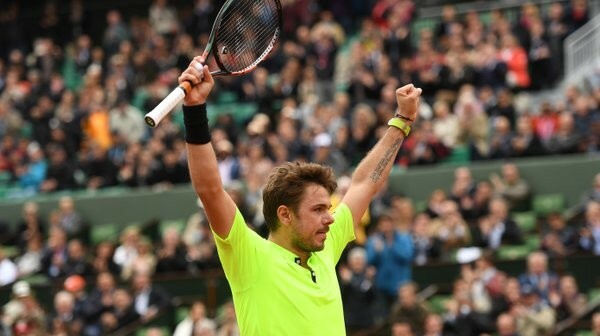 Being a Yonex sponsored player, Stan Wawrinka uses Yonex tennis apparel and the excellent over grip Yonex Super Grap . Yonex are usually adamant that their sponsored players use all Yonex gear, but guys like Nick Kyrgios have apparel and shoes by Nike etc. If you really want to have the exact same specs on your racquet as Stan Wawrinka, then you should get a Yonex VCORE 95D and customize it to the beastly specs below. It’s going to require some good technique and footwork to swing that racquet however! 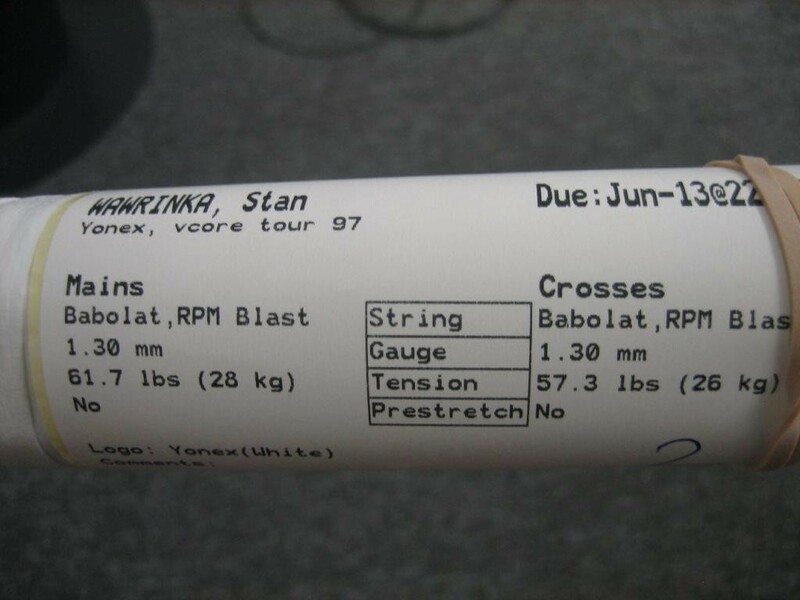 What do you think of Stan Wawrinka’s tennis racquet? Does it surprise you that he plays with something different than he endorses? That stiff poly high string tension and racquet weight combination requires some serious upper body and arm/ wrist strength. Thank goodness his frame is relatively flexible and I am surprised the swing weight is not higher than 360 for such a heavy frame, but I’m guessing it’s because he does not have lead in the upper hoop. Do the balance and swingweight happen to be strung or unstrung? Thanks! I am guessing strung, since you are specifying the strung weight, but I just want to verify.